Is there any place superior to even the alleyway tenements that the heart comes to a mutual understanding with? For there is no place superior to home (figs. 1 & 2). Of interest here is another example of lack of standardization - okurigana usage is irregular. 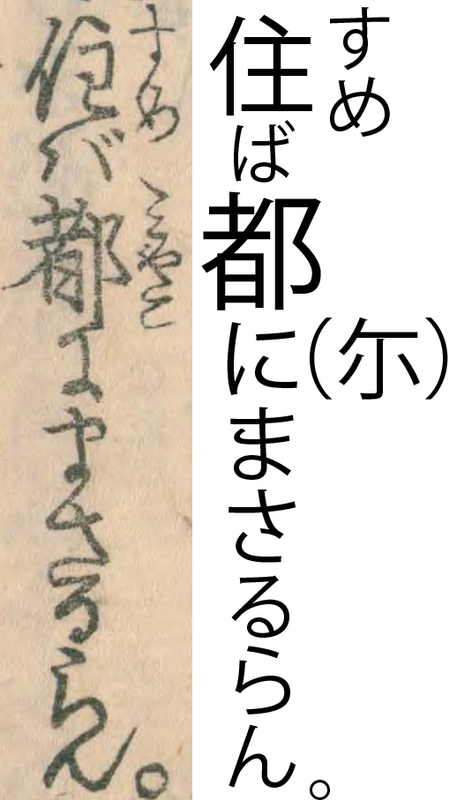 Whereas the common way of writing 「とけあう」 (for this meaning) in modern Japanese with kanji would be 「解けあう」, Tamenaga uses 「解あふ」 (with the irregular use of 「ふ」 instead of 「う」 as well). The word for "alleyway tenement" （裏借家） refers to small, rental property, implying that the families living here are not very wealthy. I don't know if it was the case in Edo, but in Heian-era Kyoto, the wealthy would live on the main thoroughfares ("avenues"), while the poor would live in the numerous intersecting alleys. In fig. 2 is a good example of classical-style verb endings. 「まさるらん」 can be broken down into the verb 「勝る」 ("to surpass"), in the predicative form （終止形）. attributive form （連体形）. 「らん」 is a sound-shifted version of 「らむ」, which indicates present speculation in this case （現在推量）. Normally, 「らむ」 is followed by the predicative form of a verb, except for irregularly-conjugated "ra-hen" （ラ変） verbs, when the attributive form is used instead. I had written in my notes that 「都」 had the meaning of "home" and not "the capital" here for some reason. Either one fits when the previous sentence is taken into context, but for different reasons. If it means "capital," that would suggest that the reason for living in a small, dingy alleyway was because anything was superior to living in the countryside. If it has the meaning of "home," then that would imply that despite the tenements' poor state, because it was one's home, that could be forgiven. That's right, it's actually Nakanogou (fig. 3). Now we know exact name of the place in Edo where the tenements are located. From the comment by Matt below, it was "the old name for the area from modern-day Azumabashi/Higashikomagata to Honjo 4 in Sumida-ku." I searched for any Nakanogous in present-day Tokyo, but all I could find was something in Mie Prefecture, which is nowhere near Tokyo. The names of these back alley places were tenuous anyway, and it's also possible that Tamenaga pulled the name out of thin air. Note that the size of the characters in the images are adjusted to be the same as that in the handwritten version, so they all line up. 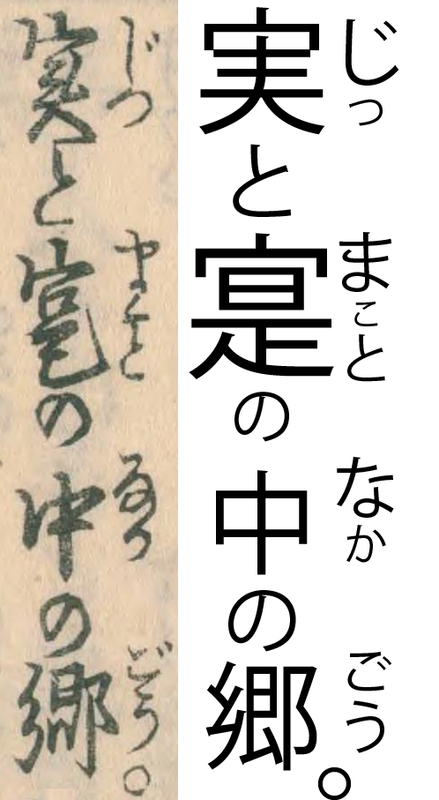 As stated previously, there are no small kana in pre-modern written Japanese. The number of dwellings is only five or six (fig. 4). 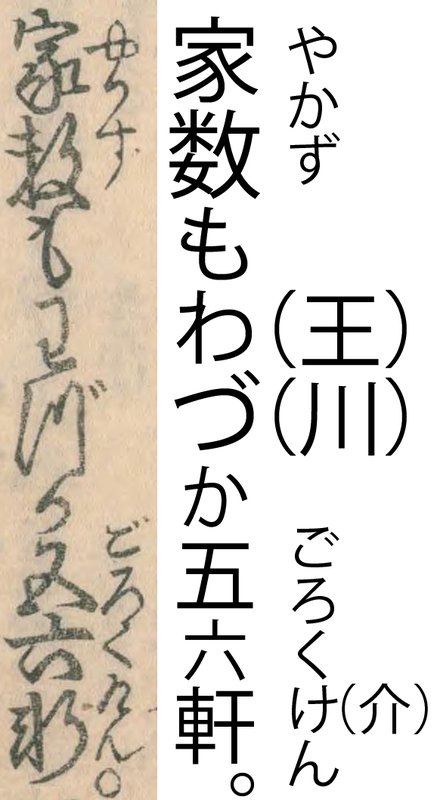 A new kana irregularity here to point out - 「づ」 is used instead of 「ず」, something that can also be seen occasionally in modern Japanese. Although these two sounds are exactly the same in modern standard Japanese （標準語）, there are dialects that still preserve differences between those two morae, and between 「じ」 and 「ぢ」, a phenomenon known as yotsugana （四つ仮名）. It is possible that a distinction was still made in Tamenaga's time, although I don't know if that has been conclusively determined to be or not be the case. Fantastic blog! Keep up the good work. One comment, though: "住めば都" is a proverb, meaning something like "there's no place like home" (at least in modern Japanese). Thanks for the tip! It's actually in the dictionary. I had written in my notes that 「都」 had the meaning of "home" and not "the capital" here for some reason. This might have been because you recognized the connection to the kotowaza "住めば都" which is sort of equivalent to "a man's home is his castle". Actually the first sentences here are joined; the 。 is more like a modern comma (this is pretty common in Japanese documents of that time period!). So "心解あふ裏借家も。住ば都にまさるらん。" would be "Even the alley tenements where the heart tokekoaus are greater than 'the capital' (i.e. splendid, wonderful) to those who live there". Normally, 「らむ」 is followed by the predicative form of a verb, but since 「勝る」 is an irregularly-conjugated "ra-hen" （ラ変） verb, the attributive form is used instead. I think you brainoed "is followed by" for "follows" -- also 勝る is just a regular verb, isn't it? The special exception for "ra-hen" verbs is just the one that gives you あるらむ instead of ありらむ. Re Nakanogou, I got curious so I looked this one up. Apparently, it was "the old name for the area from modern-day Azumabashi/Higashikomagata to Honjo 4 in Sumida-ku". Sorry for the nitpicking -- I really don't mean to be a know-it-all, just to clarify things that might confuse others. I'm really looking forward to this blog continuing, so feel free to tell me to pipe down or whatever if my commenting makes the whole experience less pleasant for you. also 勝る is just a regular verb, isn't it? The special exception for "ra-hen" verbs is just the one that gives you あるらむ instead of ありらむ. Yes, you're absolutely right. I saw 「自ラ四」 in my 古語辞典 and misread it as 「ラ変」. I'm starting up my 古語 studies after a few months, so it'll probably take me a while to get the hang of it. Not at all, keep it up! When I was studying this in college, I had a professor to correct me, so I appreciate any and all guidance I can get. It’s more or less certain that ぢ /di/ づ /du/ originally were different from じ /zi/ ず /zu/, and probaby were [di] [du] properly, as reflected e.g. in Korean transcriptions up until 1492. By the 16th century, /di/ had started to be pronounced as [dʑi] and /du/ as [dzu], as transcribed in the Jesuit spellings, ‹gi› and ‹zzu›. They were still distinct from /zi/ and /zu/, which the missionaries wrote as ‹ji›, ‹zu›. The exact date of the merger is harder to date; Frellesvig assigns it to the 17th century, and I don’t know of any radically different proposal. Notice that the various alternative sounds still occur as allophones in modern standard Japanese. So by the Umegoyomi they had probably already merged, and わづか could be either [wa.zu.ka] or [wa.dzu.ka], with [z] and [dz] not being phonemically distinctive. > It’s more or less certain that ぢ /di/ づ /du/ originally were different from じ /zi/ ず /zu/, and probaby were [di] [du] properly, as reflected e.g. in Korean transcriptions up until 1492. What exactly are these Korean transcriptions? Can I see them online? Were they produced for the education of translators? Were they written in hangul, or using something like Idu/hyangchal? In this case I was citing Frellesvig, who was citing the Irop'a, a Japanese textbook for Korean officials in modified hangul. I don't know of an online version (I don't know Korean), but there's some more information here. • The Christian romanization, and other scattered foreign transcriptions. • Cognates in Ainu, Korean, Ryūkyū, dialects etc, through the comparative method. • Writings of the Japanese school of Sanskrit studies (shittangaku) (kind of imprecise). • Errors in spelling. The orthography is conservative, but presumably errors increase after mergers, and in most cases there's a noticeable jump in variation in the periods we'd expect from other evidence. Eventually native scholars (Fujiwara-no-Teika, Gyōa, Keichū) had to make an explicit effort to prescribe etymological spelling. • For Old Japanese (Nara) and Heian, the choice of Literary Chinese characters used in phonogram transcriptions of Japanese (though here one must be careful of circularity, since Old– and Middle Chinese reconstructions themselves draw on Old– and Middle Japanese proposals). I recommend Miyake on this latter topic, and Frellesvig for more details (also Martin, if you're lucky enough to find it).